Be the first to share your favorite memory, photo or story of Marianna. This memorial page is dedicated for family, friends and future generations to celebrate the life of their loved one. Marianna Lambert Burkholder, age 90. of New Windsor, died Thursday, October 25, 2018 at Copper Ridge, Sykesville. Born January 5, 1928 in New Windsor, she was the daughter of the late Russell C. and Ruthanna Babylon Lambert. She was the wife of Winfield C. Burkholder who died in 1993. Mrs. Burkholder was a graduate of New Windsor High School in 1945 and the Baltimore Business College in 1947. She retired from the finance office of the Brethren Service Center, New Windsor, after 32 years of service. She was also the co-owner of the New Windsor Laundromat. 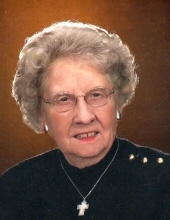 Marianna was a lifelong member of St. Luke’s (Winters) Lutheran Church, New Windsor where she served as the organist for more than 30 years, council president and several terms on the church council and treasurer of the Sunday school and cemetery. She also served on the Cooperative Board of Carroll Lutheran Village and was a charter member of the New Windsor Ladies Auxiliary and Drill Team. In the 90’s she volunteered as a patient advocate in the emergency room at Carroll County General Hospital. More recently she served as organist for Mt. Union Lutheran Church, as a hostess for Hartzler Funeral Home and volunteered in human resources at the Brethren Service Center. She enjoyed boating and fishing from White’s Ferry to Dargan. Surviving are son and daughter-in-law, Douglas R. and Mary Burkholder and sister, Alice Cheeks, all of New Windsor; nephew, Jeffrey W. Cheeks and wife Carol and their daughter, Lauren, of Taneytown. A funeral service will be held at 11:00 a.m. Tuesday, October 30 at Hartzler Funeral Home, 310 Church St., New Windsor, with her pastor, Rev. Anne Durboraw, and a former pastor, Rev. Darrell Layman, officiating. Private interment will follow in Winters Cemetery. The family will receive friends at the funeral home 6-8 p.m. Monday, October 29. In lieu of flowers memorial contributions may be made to St. Luke’s Lutheran Church, P.O. Box 447, New Windsor, MD 21776. The family invites you to leave a message or memory of our “tribute wall” at www.hartzlerfuneralhome.com. To send flowers or a remembrance gift to the family of Marianna Lambert Burkholder, please visit our Tribute Store. "Email Address" would like to share the life celebration of Marianna Lambert Burkholder. Click on the "link" to go to share a favorite memory or leave a condolence message for the family.